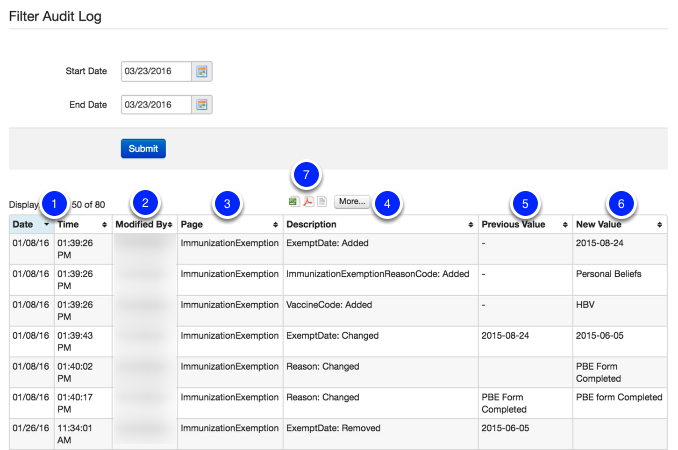 This lesson shows how to use the Auditing feature within the Health module. This feature allows those with permission to review the Audit Log of any an all changes made to a student's health history. 1. Select the Health tab. To view a complete student profile for the selected student, select Health Profile (3). 1. 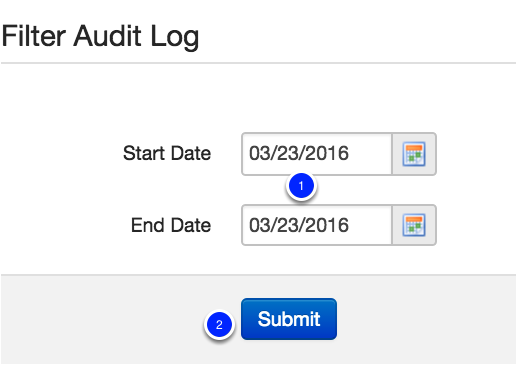 To review a student's Audit Log, select a Start Date and End Date. 2. Then select Submit to generate results. Page (3) shows what page the user made changes on. A Description (4) of what has been changed (such as Caution, Procedure, OfficeLog, Immunization, etc.) will be provided including if it had been Changed or Added. New Value (6) shows what the current value now is. To print or download the Audit Log, select the various Print Options (7) such as Microsoft Excel, Adobe PDF, Word Processor, or More for other formating options. Now that you have learned how to review Health Audits made to a student's profile, visit the Health Office Log lesson.